It all started with a single vintage photograph. One day Dee Myles, Katherine Dattilo, Natalie Tame, and myself decided to have a draw-off based on an image that Dee found while browsing for inspiration. The rules were simple: keeping true to the given composition, create your own original work of art. On the first round we were pretty timid, or at least I was. Now that there are more of us and we select a vintage photograph to work with every month, we have each developed an unmistakable style. 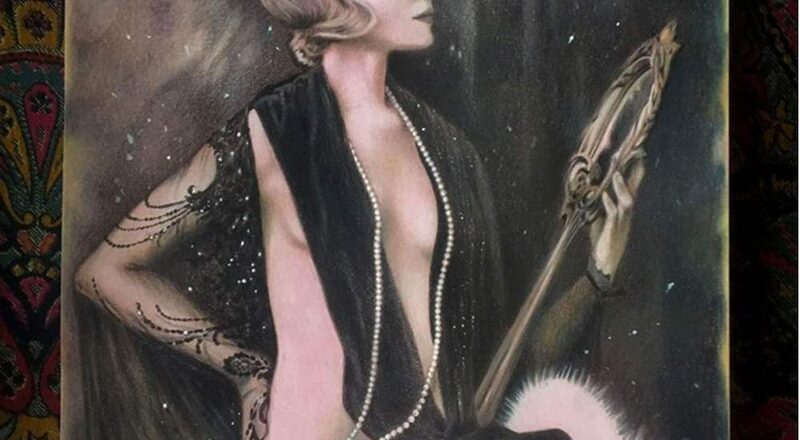 Dee has chosen to paint her vintage models in an art deco style and always with a reference to a famous film. Katherine is the queen of digital painting and is blowing our minds with fantasy based photorealism. 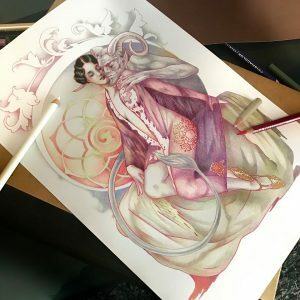 Natalie uses classical art as inspiration to create stunning drawings and paintings. Me, I play with different styles and different media, but I always introduce at least one new character into the scene, usually somehow dark and spooky. I did my first submission in pencil on paper, focusing on textures and, of course, adding a creepy ghost girl to the background. 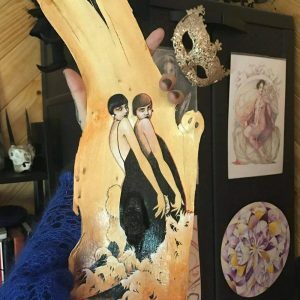 Some of my following pieces were done in color pencils, some digitally painted, and one even painted on a piece of drift wood. After several monthly draw-offs the Vintage Drawing Coven was born. Now we are a small and private drawing club. We welcome newcomers of all experience levels as long as they are interested in challenging themselves and in creating original art based on vintage photography. The four of us who are experienced artists take the time to analyze other members’ submissions, give them tips and suggestions, but mostly praise them because so far all submissions have been incredibly honest and beautiful. Some of our newer members are truly delightful because they are daring to test new artistic waters. Some haven’t created their own art in years, some never. Most have, one way or another, been discouraged from doing so by others. We provide them with a space that is free from judgement, yet full of useful guidance. 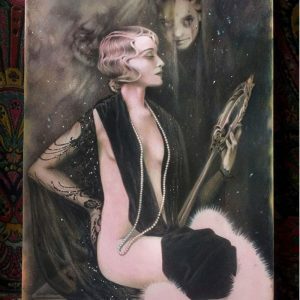 For us, the Witches of Vintage, this little group is a place where we can play as artists. We use every new photograph as a chance to create something we wouldn’t have otherwise taken the time to create. We surprise ourselves with the outcome every time. As a pleasant and useful side effect of this drawing frenzy, we are all building additional art portfolios without the burden of deadlines or stylistic limitations. In order from left to right the images above are by Katherine Dattilo, Dee Myles, the original photograph, Lisa Mitrokhin, and Natalie Tame.